Cultural Center programs serve as an integral component of the Cultural Center by providing a sense of belonging, and complimenting student success initiatives, to ease transitions and support the racial/ethnic identity development of underrepresented students, in addition to academic support and holistic development. Heritage & identity-based programs seek to foster a sense of community amongst students and the campus community by highlighting the diverse cultures represented at the University and fostering intercultural engagement. 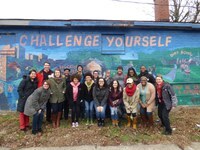 These programs strategically highlight underrepresented or marginalized populations to ensure a sense of belonging and connectedness to the UofL community. In like manner, these programs are designed to acknowledge difference, while cultivating a shared sense of community, support, and belongingness for all students and campus community members. The Diversity Dialogue Series is a series of conversations around the idea of increasing cultural competence and understanding of diversity and social justice issues. Popular topics presented include Islamophobia in America, Equity vs. Equality, LGBTQ Support, Advocacy & Allyism, Women in the Civil Rights Movement, From Pre-School to Penitentiary, Unsung Heros: Perceptions and Stereotypes About Military Service-members, and more. The University of Louisville Cultural Center commemorates Dr. King’s legacy by hosting an annual week-long series of events that honor the life and legacy of Rev. Dr. Martin Luther King, Jr., and educate the UofL campus and community on the importance of actualizing Dr. King’s ideals of social justice, non-violence, education, and service. The goal of MLK Week is to foster an inclusive campus and local community committed to equality and social justice. We honor Dr. King for his work toward racial equality and justice for all people and for his dedication to nonviolence. 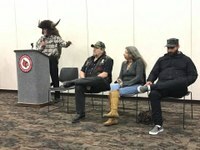 The week-long event series provide UofL students, faculty and staff, a unique opportunity to learn more about the history of social justice and civil rights challenges, current community issues, and actions to create positive change. Annual MLK Week events include the MLK Day of Service, Louisville Civil Rights Bus Tour, and the MLK Dream Wall Signing. 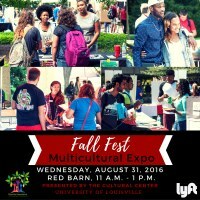 Fall Fest is a celebration of diversity and welcome event for freshmen, transfer, and returning students to connect with each other, and learn about Cultural Center programs, multicultural student organizations and UofL's diverse community with food, performances, and more. The Multicultural Student Organization (MSO) Leadership Summit serves as one-day event for student leaders to connect with one another, discuss issues facing their communities and organizations, as well as identify inter-organizational goals and opportunities for collaborations. Participants learn about leadership and personality styles, as well as foundational organization skills such as, communication and collaboration, event planning, marketing and publicity, fundraising, representation, branding and recruitment, and more. Registration was capped at 50 students. The Cultural Center Graduation Celebration pays homage to the past, while celebrating the future and endless possibilities of all graduating underrepresented students at the University of Louisville. This annual event provides an opportunity for the university to acknowledge the achievements of underrepresented students and for graduates to thank those that have contributed on their journey to success. The 2017 Graduation Celebration recognized 168 graduating students in front of approximately 200 family, friends, faculty, staff, and community members. The Cultural Center collaborates with partners like the Career Development Center and BB&T Bank to offer programs that prepare students for their future careers and connect them with leading companies locally and nationally that value diversity. 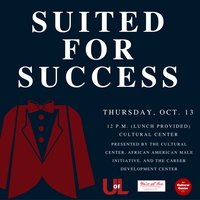 Popular topics include: Managing Your Brand, Suited 4 Success, Preparing Your Elevator Speech, and Credit Counts. Stay in the know about all Cultural Center News & Events by subscribing to our newsletter and announcement listerv here! For more information about Cultural Center programs, contact Dominique McShan at dom.mcshan@louisville.edu.